iMuseum Website Design and Programming - Gooii: Award Winning Website Design & App Development Nottingham. iPhone, iPad & Android Apps. Virtual Reality & Augmented Reality. The iMuseum website gives users free and growing online access to the Manx National Heritage Museum Collections, Manx National Heritage Library & Archives and the Isle of Man Sites & Monuments Record. The website also features a vast searchable database of almost a million records including census and people records, family history records, births, deaths, baptisms, first world war internees as well as a host of other museum and archive records dating back 150 years. 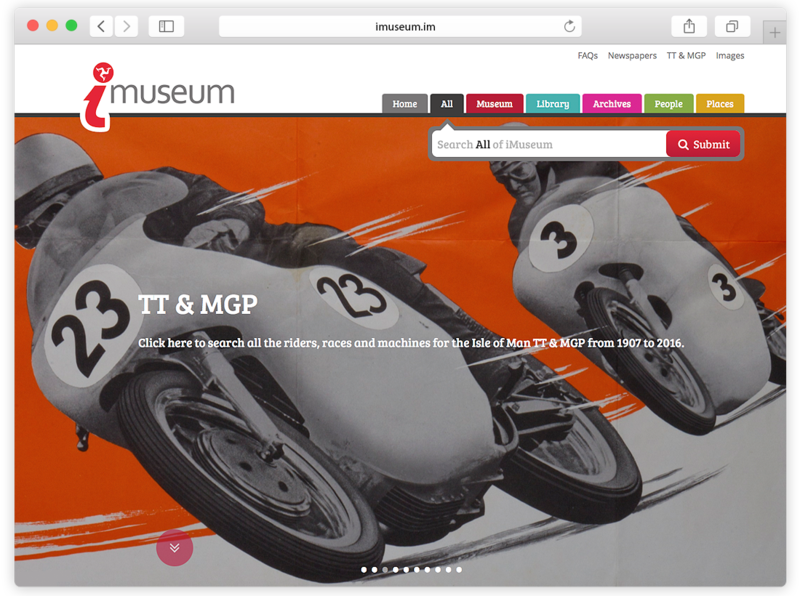 iMuseum contacted Gooii to ask for their specialisation in website design connecting to large datasets to create a solution that was simple, easy to use and give quick public access to the archives. Since launch the site has been really well received by the user base who have been impressed with the speed and clarity of the data delivery. The site uses WordPress as a content management system for publishing curatorial blog content, whilst the Object, Archive and Library records are queried from an Elasticsearch index which is populated via Knowledge Integration‘s middleware CIIM product, through a bespoke CodeIgniter search UI, with Zoomable imagery delivered through a customised OpenSeadragon instance. WordPress was selected because of their previous experience with this platform and how easy it is to modify and add new content by staff at the museum so they are more self sufficient going forward.